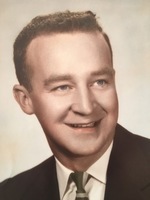 William Joseph McGowan, 89, of Pawcatuck and recently of Westerly passed away on November 26, at the Royal Westerly Nursing Home. Bill was born in Westerly, the only child of the late Thomas Henry and Winifred McGowan. He was predeceased by his wife, the former Agnes Rita Shea. Bill joined the Army right after high school and served before and during the Korean War. He then went on to receive his BA from St. Michael’s College in Winooski, VT, and returned to Pawcatuck where he was employed by General Dynamics/Electric Boat until he retired at the age of 62. He was a communicant of St. Michael the Archangel Church. Bill is survived by his only child, Erin McGowan Collins and her husband William of Marlborough, MA, and Westerly, RI. His three grandchildren, Audrey Shea Collins of Seattle, WA, William Edward Collins, Jr., of Watertown, MA, and Joseph Thomas Collins of Denver, CO. The family would like to thank the staff at The Elms and Royal Westerly for their care and support during Bill’s last few years.